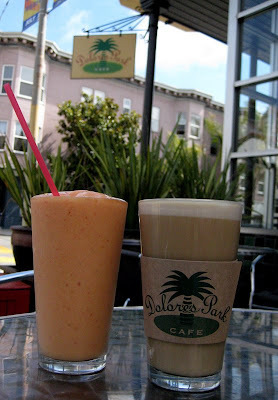 Right across from Dolores Park, there’s the adorable Dolores Park Cafe. I don’t know how they scored such an awesome location, they must have signed some kind of pact with the devil. There’s indoor seating along with some limited seating out front. A cool and refreshing smoothie along with a cafe au lait. We wanted to fuel up before playing tennis across the street. And no, I can’t play tennis… not at all. 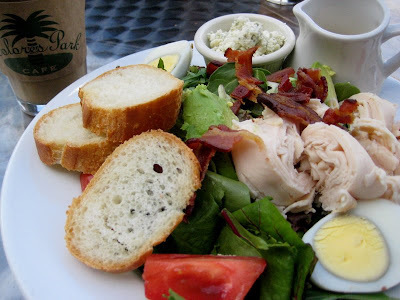 Cobb salad! I don’t know what kind of bacon this was, but it was especially good. Blue cheese on the side, and also blue cheese dressing. A little too much blue cheese if you ask me. Would have been better with something less creamy and super light. But all the components of this salad were super tasty. Excellent tomatoes! 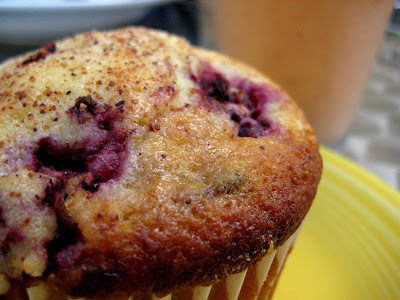 I wasn’t super hungry, so along with the smoothie, I just had this lemon blackberry muffin. Super good. It’s a lovely little spot.